Not Available for Shipping to Hawaii or Puerto Rico. This package contains a mix of nematode species: Steinernema feltiae (Fungas Gnat Exterminator), Heterohabditis bacteriophora (Grub Exterminator) and Steinernema carpocapsae - Flea Extertminator. 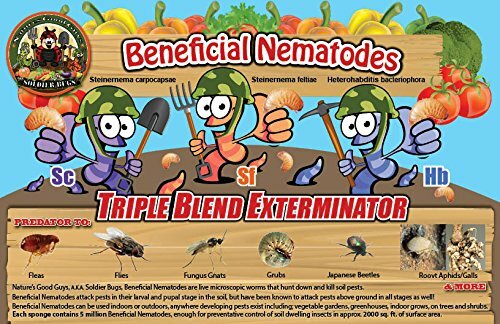 Attacks: Ants (Queen),Asparagus Beetles,Armyworms, Artichoke Plume Moths, Bagworms, Banana Moths, Banana Weevils, Berry Root Weevils, Beet Armyworms,Bill Bugs, Black Vine Weevils,Black Cutworms, Bluegrass Weevils,Cabbage Maggots, Carpenter Worms,Borers -Iris, Tree, Vine, Carrot Weevils, Caterpillars, Chinch Bugs, Codling Moths, Chafers, Citrus Weevils, Colorado Potato Beetles, Corn Root Worms, Corn Borers,Corn Earworms, Cotton Bollworms,Cranberry Girders, Cranberry Root Weevils,Crane Fly Larvae, Crambids,Crate Flies, Cucumber Beetles, Cutworms, European Chafers, Flea Beetles, Fleas -Adult, Fire Ants,Fleas, and More! These microscopic round worms attack over 200 species of soil pests! Simply add water and release with a watering can, hose end sprayer or other apparatus. Complete instructions included. Nematodes actively hunt for insect larvae, entering through natural body openings. Once inside the larvae, the nematode excretes bacteria from its digestive tract before it starts to feed and multiply. Within a few days the pest will change color and die. The nematodes multiply and develop within the dieing insect, before leaving the old host to hunt for more pests. As the number of pests decrease, so will the nematode population. For this reason seasonal releases are recommended. Storage Storage temperature 36-45˚F. DO NOT FREEZE Store unactivated nematodes for up to 30 days. Once activated nematodes must be released within 6 hours. Store nematodes in the dark. Environmental Conditions Nematodes are susceptible to ultraviolet light (UV). Nematodes are susceptible to various chemical pesticides. Use caution when treating other diseases and pests. For optimal results, the ground surface should be moist. Beneficial Nematodes are a natural and effective way to control soil pest without using harsh chemicals. Beneficial Nematodes are microscopic round worms that attack over 200 different species of soil pests. Our Live Beneficial Nematodes are Guaranteed Fresh and Alive! Treats up to 15,000 Sq. Ft. Depending on Infestation. If you have any questions about this product by NaturesGoodGuys, contact us by completing and submitting the form below. If you are looking for a specif part number, please include it with your message.